If we had to pick one system above all else that must be 100% reliable we’d say steering. Which is why we fit two complete auto pilots, two independent hydraulic systems, and use intensely muscular structural elements. Most of this is easy, but establishing the engineering scenario for the rudder itself takes a bit of work. As we are just wrapping this up for the FPB 78, we thought you might find the logic of interest. With our type of hull shape and displacement, there is little resistance to turning, and the boats tend to pivot on the bow. When significant load is applied to the stern, say by the rudder developing turning force, the stern slips sideways, pivoting as it were on the bow. In all cases, save for one, this minimizes the force the rudder can actually generate in the rudder shaft. That exception is when a breaking crest slaps the stern from near abeam, and the rudder attempts to correct course while fighting the wave at the same time. This would be our idea of a high load scenario. Speed, in our case, is an interesting calculation. Do we use normal cruise, maximum smooth water speed, or surfing? In the latter case do you take credit for the circular molecule motion (theoretical) which is said to reduce rudder efficiency when surfing? As you will see below, our rudder shafts are very conservatively engineered for the seagoing loads, and have huge factors of safety. What we are more concerned with is engineering for mistakes in navigation, i.e. hitting the bricks. The key here is trying to engineer the bottom portion of the rudder so that it is weaker than the shaft, and bends or breaks off before the rudder shaft reaches its elastic limit (deforms). This not easily engineered, and at best all you can do is hope you have it right. But as we have yet to bend a rudder shaft, we think we may be headed in the right direction. The name of this game is damage tolerance, having a degree of probability of running aground and then getting off and continuing to cruise without visiting a boat yard. Odds are one of the stabilizer fins might have departed, but we can live with that. The steering system must remain functional. This brings us to the type of rudder support, and if the bottom edge is exposed or there is a protective beam between skeg and rudder bottom. Protective beams are quite common. However, if you are bouncing the weight of the aft end of the boat in the middle of that beam, odds are it will bend upwards. Then it jams the rudder or prop, or both. Pick your poison. A skeg hung rudder requires a bottom rudder bearing. If the skeg is damaged, and the bottom bearing jammed or chewed off, there is no longer sufficient support for steering the boat. All of which adds up to one of the reasons we use spade rudders. Properly engineered, they provide the highest factors of safety in the event of a grounding. And by far the best steering control. Now some numbers. 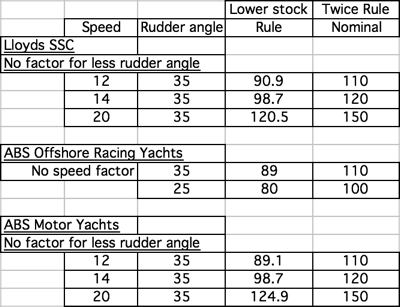 The table below has data for the Lloyds Special Service Calculations and American Bureau of Shipping Racing Yachts and Motor Yachts. These include input data for the size and shape of the rudder, and the speed, along with angle of attack. The column headed “Lower Stock Rule” has the required diameter of a solid aluminum rudder stock. The far right column, “Twice Rule Nominal” is the required solid aluminum stock diameter for two times the required rule stiffness. Dimensions are given in millimeters (divide by 25.4 to convert to inches). There are three sets of speeds shown: 12 knots, which we consider to be the normal maximum cruising speed, 14 knots, which will be often seen surfing, and 20 knots, representing the peak surfing speed we are likely to see on occasion (although more is possible). Starting at the top, at fourteen knots, twice the rule induced stiffness comes out to 120mm (just under five inches) of rudder stock which also happens to represent the Lloyds SSC diameter at 20 knots on the basis of 100% of the rule requirement. ABS for racing yachts has no speed input, but does allow changing the angle of attack for the rudder. Here we see 110mm (4.4″) solid stock working out at 35 degrees of deflection. ABS for motor yachts allows us to vary speed, but imputes a 35 degree AOA. Here 20 knots and a 35 degree AOA on the rudder equates to 5″/125mm solid shaft. Same AOA and fourteen knots, gives us twice the ABS rule stiffness . All of the above confirms what we knew starting out, namely that a 125mm/5″ solid shaft would do the trick. We just wanted to run a few numbers to verify all of this. At a later date we will discuss making the tip of the rudder blades frangible, so they fail before the ruder stock permanently deflects. This entry was posted on Tuesday, June 18th, 2013 at 4:16 am and is filed under Dashew Logs, FPB 78, three. Both comments and pings are currently closed. Seems odd (to an untutored eye) that the rules should specify stiffness when a bit of spring would, in the event of an impact, help protect both the rudder and the shaft housing. Perhaps its a steering control thing. Could you tell us a bit more about your sacrificial rudder bottom? Is the idea that the remaining part of the rudder is enough to steer the boat to safety? Will you be carrying a spare rudder? And is fixing it a matter of heading to the nearest sheltered spot and getting out your swimming trunks or would the owner need help? And do you plan to test your design and post the video? All of this damage tolerance, frangibility as it were, is theoretical for us. Although we have been aground many times, even scraped a bit of paint of the rudder(s), we have not (yet!) broken off the tip. In terms of stiffness, with aluminum there is not much spread between yield and failure, so you really do want to stay clear of the yield point. Any bend in the shaft will tend to bind the shaft in the rudder bearings, so in an ideal world bend shaft deflection is minimized. As to steering the boat, a majority of the time you could steer the boat with half the foil and still have good control. Depending on the damage mode, we might just leave the damaged blade tip in place until it was convenient to deal with the problem. Hi Steve, did you build a spreadsheet for grinding the numbers or do the numbers come from an off the shelf software program? We have our own spread sheets with formulae, and then also use various rule software. Sometimes the software is produced and sold by the various survey societies, for example Lloyds or ABS. Other times we just take there requirements and put them into the spreadsheet. On occasion, this being one of them, two or three of us will write down what we think the answer will be, then we’ll run the numbers, and often we’ll have had the answer in front. But we still run the numbers. In the case of the rudder shafts, all three of us knew what the answer would be without consulting each other. The key thing with all of these structural rules is to understand how they apply to your goal, and then modify accordingly. For example, we can tell you with 100% certainty that 20 years ago if you used the ABS rule for keel design, and hit a reef going at a speed length ratio of any magnitude, you were going to the closest boat yard ASAP. On the other hand, we also knew if you used four times the ABS keel rule, you would have a reasonably high degree of probability the keel and related structure would enable you to keep cruising. Same with the ABS topside stiffness limits in those days. A yacht worked hard upwind and built to the rule would be expected to show signs of problems. But if you double the required stiffness, you would be OK. There are hundreds of examples like this in the specifying and engineering of yachts. You and Linda just blow Marina and I away at the insite and completeness of your concepts . The technical aspects of your designs are so simply functional in all aspects ,I’m sure based on first principles . Can’t wait to see the build progress , may have to make a trip to Circa when you are there during the build . Looks like you have taken up all of Circa with all the building going on , are they doing any other contracts other than FPB’s ? Circa are flat out on our projects. Hope to see you down under! Come for a ride in a couple of years. Regarding rudder design. I have been researching failures in catamarans. It seems clear that the top two reasons for abandoning are turtling and rudder failure. On rudder failure, every one I could find did not have a skeg. I have concluded I should not get a boat without a rudder skeg. I appreciate you have strengthened every thing else about your rudder, but thee is no skeg. Your thoughts? It is not just catamarans that earn a bad rep for spade rudders breaking , many other types of boats have had catastrophic failure on spade rudders ,due in part to bad design parameters and build parameters . I know of one very popular catamaran manufacturer that has sleg hung rudders that have also failed , not by design ,but by build . The builder took it on to build the rudder post out of to thin a material and not through weld the tabs ,so the rudder failed to turn when the tabs tore out of the post . I have been in the marine industry for many years , now retired ,but dealt with many offshore race boats ,in both mono and multi flavor and all had spade rudders , some extremely high aspect and very thin ,not to mention very deep , some with 10′ long blades . In all this time I may have seen one failure due to design ,although I saw a few with impact damage due to UFO strike or grounding . There was no option for failure in design on these boats because rescue was out of reach so they where designed and built properly . I have had the pleasure to know Steve and Linda for a while now and have been on the first FPB Windhorse and a number of other of Steve’s designs , and one thing struck me and that was all his boats where designed and engineered and built to a level of quality everybody can rely on . I did not see any part of any design that lacked anything and Steve had thought of everything and more . In particular I looked at the rudder and steering mechanism on Windhorse because Steve had my then 3 year old daughter steer the boat into port with a joystick and I was very impressed with the whole system . I certainly would have no problems with any of Steve’s products and my family and I are just getting set to do some Expedition type sailing around the world on a catamaran .